As Anambra State governorship election billed for November 18, 2017 is around the corner, report reaching the news desk of Family Writers Press has it that Niger Delta Militants are already all over Anambra State waiting for the final showdown with anyone encouraging the election as Anambra people have unanimously rejected the election. It could be recalled that Anambra people have made it open to the world that there be no election in Anambra State come November 18, which they will be manifested through 100% election boycott. The militants from Bakassi peninsula, Cross River, Akwa Ibom, Bayelsa, Rivers and Delta States are already taking position in all nooks and crannies of Anambra State because of the preparation for the showdown with Nigeria military who vowed that the election must hold. Considering this reality, the people in Anambra State are advised to stay indoors to avoid regret or being attacked by Nigeria army in the name of looking for the militants. Let nobody in Anambra State risk his or her life coming out of his or her compound because anybody sighted outside that day of election, it is either you are a militant which is the biggest target of the Nigerian military or you are Nigeria Army officers which is the prime target of the militants. It is important to state it clear that no Biafran is worth dying for the election which we have unanimously rejected. Are living in any part of Anambra State, the good thing you will do for yourself and your family is to stay indoors from 5. 00 PM of November 17th to 5. 00 PM November 18th. 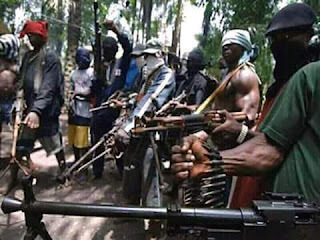 The militants according to their programs will take over Anambra State in the mid night of November 17th to avoid casualties against the civilian populace. But if anybody mischievously doubt this and venture going out to vote that day, you would have committed intentional suicide because if the Nigerian military do not shoot you thinking that you are a militant, the militants could wound you for being rebellious against the collective desire and will of your people. The only thing that will make you safe is staying indoors but if you go out, blame yourself if anything happens to you. A secret information reaching the news desk of Family Writers Press has it that Gov Willie Obiano purposely told Nigerian Army to wait until during the elections before they kill people in Anambra State as they killed in Aba and Umuahia. Gov Obiano told them that if they kill anybody before the election day, it will spoil the election as planned. It could be recalled that a killing solitary field has been secured for the murderous Nigeria military in Oba, Anambra State by Gov Willie Obiano which the written document from the Government house was recently circulated all over social media. On the election day proper, Nigerian army will be picking Biafrans and taking them to the solitary field in Oba, Anambra State for secret annihilation and decimation. With all these information, if anybody in Anambra State comes out on the day of election to cast any vote and the blood thirsty Nigerian army capture the person and kill him, heaven will blame the person. Let it be known to all the people of Anambra State, the killing of Biafra people in Anambra State as done in Aba and Umuahia will be specifically on November 17th, 18th, and 19th in different cities of Anambra State such as Awka, Nnewi, Onitsha, Ihiaia, Ekwulobia, Atani, Umunze, etc. Are you in Anambra State, run for your lives by staying indoors especially on the election day proper because Nigeria army has completed plan to waste numerous Biafra people that day. But Niger Delta militants will also be monitoring the situation to make sure that Biafra people stay at home that day. In conclusion, Anambra election does not worth the blood of any Biafran. So, our people in Anambra State must remain indoor from morning till night on the election day to avoid becoming victim of circumstances when you can avoid it due to warning we have being giving to our people all these days.